The mid-January snowstorm cleared off overnight. By morning, the temperature had plunged to minus 25 F, and the mountain valley around me was muttering about the cold. Sap deep inside the pine and fir trees had started to freeze hard, making the woodlands creak and pop. The lakes banged and whoomped as their ice cover expanded. Even the air felt brittle, scraping the inside of my throat as I skied hard toward the valley's upper end. I was tracking the male wolverine we called M1. His big paw prints were fresh. He must have come through at dawn. But where was he bound? There was nothing before him but a sheer headwall whose rim marked the Continental Divide, where the snows were far deeper and the temperatures lower yet. I stopped skiing after a while. My goal hadn't been to catch up; I'd simply wanted to reach a point high enough to let me monitor M1's radio signal a while longer. He was one of a number of wolverines carrying transmitters as part of a six-year-long study in Glacier National Park, Montana, directed by Jeff Copeland and Rick Yates of the U.S. Forest Service Rocky Mountain Research Station. I was part of a band of volunteers who helped capture and follow the animals, learning the hard way that no carnivore in North America keeps on the move as constantly as a wolverine does. Or as fearlessly. They may not be as well-known as wolves and grizzly bears, but the wolverine and another small forest predator, the Canada lynx, still need help. These rare wild hunters were once found throughout the northern tier of the lower 48 states, but today one of their last strongholds is the northern Rocky Mountains. For years, Defenders staffers have focused on tackling immediate threats to these creatures: trapping in Montana, plus the loss and fragmentation of their habitat from logging, road building and other activities. We continue to work on these issues, but a looming peril may make all of our progress for naught—global warming. Wolverines suffer from global warming because they need deep snow where they can dig dens to protect their young, and they don't tolerate warm temperatures. Lynx also rely on deep, soft snow, where their light weight and huge paws allow them to hunt snowshoe hares and escape from mountain lions, bobcats and coyotes. In addition to supporting studies on the impacts of global warming on wolverines and other wildlife, Defenders is working to win protection for wolverines under the Endangered Species Act. Our staffers are also organizing teams of citizen scientists in the northern Rockies to learn about and help protect corridors of natural habitat for lynx, wolverines and other native animals, so that they can move safely in response to a changing climate. "Nobody can say for sure what the future may bring," says Defenders' Rocky Mountain representative David Gaillard. "But I want to be able to look my daughter in the eye and say we are doing everything we can to prepare lynx, wolverines and other wildlife that she loves for the big changes ahead." Learn what you can do to help wolverines, lynx and other wildlife survive climate change. When the male reached the headwall, he started up its towering stone face via a cleft known as Iceberg Notch. It would have taken me half a day to reach the top of the nearly vertical, 1,500-foot chute using climbing rope and pitons. But M1 didn't pause. With his two-inch long claws digging into the wind-packed snow like crampons, he scaled the wall in about 20 minutes. Then he crossed through the notch in a plume of gust-driven flakes and dropped onto the Pacific side of North America. The ridgeline blocked his radio signal. And just like that, the wild mountaineer was gone, off to patrol the rest of a territory that encompassed almost 200 square miles along the continent's crown. The wolverine, Gulo gulo, arose during the latter part of the Pleistocene epoch, when glaciers still claimed much of the Northern Hemisphere. Though this hunter-scavenger ranks as the biggest terrestrial member of the mustelid, or weasel, family, it is only about three feet long (four counting its bushy tail) and weighs just 25 to 40 pounds on average. But what the gulo lacks in stature, it makes up for in strength and intensity. In addition to taking down prey as large as adult caribou, solitary wolverines have been seen driving grizzly bears from food. That's world-class attitude. Given the wolverine's Ice Age origins, it's not too surprising that it can survive some of the most extreme conditions in modern-day winters. But what this elusive and little-studied carnivore may not be able to take is more heat. Wolverines depend on cool year-round temperatures and deep, persistent snows. As habitats with those qualities shrink in an era of rapid global warming, so do this species' chances of survival, making it something like a land-based counterpart of the better-known polar bear. Perhaps the most critical period for wolverines begins in February, when pregnant females go into dens dug from the snowpack. They give birth at the end of that month or the start of March. Wolverines don't hibernate. Nor does a mother keep to the den while living off energy reserves. She regularly heads out hunting, often covering dozens of miles. At some point, she may move the young, called kits, from the birth den to a second den and sometimes a third—particularly if there has been a disturbance in the area. The nursing young will remain hidden away for a full 10 weeks, well into May. Fewer than two dozen wolverine dens have ever been located in the Lower 48. About half of those were discovered during the Glacier Wolverine Project, which Defenders of Wildlife helped fund. Many of the rest were found during an earlier study by Copeland in Idaho and another long-running study, headed by Bob Inman, in the greater Yellowstone ecosystem. Nearly all the dens were located at high altitudes and eight to 10 feet down in the snowpack. Baby wolverines, which weigh only a few ounces at birth, need every foot of snow overhead for insulation—and for protection against passing predators. 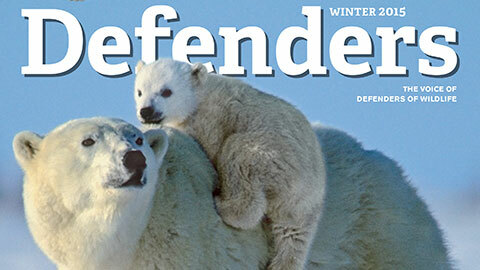 See how Defenders is helping to save wolverines. Deep snow and prolonged winter conditions benefit wolverines in other ways, too. These animals' feet are enormous relative to their body size. Like bears—and humans—gulos land on their heels as well as the front part of their feet when walking or running. This full-sole contact spreads the wolverines' weight like snowshoes, giving the animals a major advantage in mobility over competitors and prey. A long, harsh winter drains the energy reserves of hoofed animals, leaving some dead, available for scavenging, and others weaker, more easily brought down for dinner. In mountain terrain like Glacier, heavy snowfalls also mean more avalanches. These claim their own share of the grazing herds. "Wolverines also cache a lot of food in snowbanks and in boulderfields that often have snowmelt running underneath," Inman says. "I think some of these supplies not only keep for months but might even stay available from year to year." Wolverines have a somewhat higher basal metabolic rate than other animals their size, which means their internal fire burns a little hotter. To help hold in heat, they wear a long, luxuriously thick coat. Trappers prize this fur because the texture of wolverine hair also keeps it from absorbing moisture. Used for the trim on parka hoods, it readily sheds frost that would otherwise build up from steaming breath. Help save wolverines at our Wildlife Adoption Center. Take action for wildlife at our Wildlife Action Center. The list of adaptations helping wolverines contend with winter is impressive. But until scientists started to focus on climate change, no one gave much thought to how animals with a warm fur coat, a stoked-up metabolism and food cached in nature's refrigerators handle bathing-suit weather. The answer is: by avoiding it. Jeff Copeland and other wolverine scientists used satellite imagery to create a map showing where snow lasts through the first half of May in the Northern Hemisphere. Then they mapped out the general distribution of Gulo gulo. Predictably, the two patterns were nearly identical. Next, Copeland and his colleagues took a closer look at the species' exact whereabouts in western North America. "When we charted temperatures in the southern portion of wolverine range, we discovered that the animals rarely occurred in places where the average maximum daily temperature in August exceeds 70 degrees F," he says. "In other words, hot weather may have as much to say about where wolverines live as winter snow does." Gulo gulo is fairly widespread in the Arctic, the subarctic taiga and the boreal forest, Copeland explains. Farther south, the animals have to go up in elevation to find the accumulations of snow they require for denning, just as they must to reach more tolerable summer temperatures. This is why they are restricted mainly to western mountain regions in the lower 48 states. During frontier times, wolverines were at home in the snowcapped ranges of the Pacific states all the way to the Sierras of southern California and down the Rockies into northern New Mexico. But unchecked trapping and poisoning wiped out the species south of Canada early in the 20th century. With stricter limits on the use of poisons, wolverines eventually returned along the Canadian Rockies to the Glacier Park area and began recolonizing neighboring mountainscapes. Today, they are found mainly in remote uplands of Montana, Idaho and northern Wyoming, plus there is a small resident population in Washington's North Cascades. Altogether, the wolverine enclaves in the contiguous states may hold 450 animals, but more likely 250 to 300. Either way, the total is much smaller than it was for grizzlies, wolves or bald eagles when those species were declared threatened or endangered. Defenders and others have submitted petitions to add wolverines to the federal list over the years, but between bureaucratic inertia, political interference, scarce data and lack of popular support, Gulo gulo still has no official protection. In fact, the animal is currently being legally trapped in Montana, which likely holds 100 to 150 at most. Wolverines naturally exist at extremely low densities. For example, 1,500-square-mile Glacier Park supports the largest, densest group south of Canada, yet it amounts to no more than 40 to 50 animals. Why? Because their territories are so immense. In addition to the fact that wolverines will always be very thinly spread even in the best of homelands, conservationists trying to secure the species' future have to take into account its low rate of reproduction. Gulos live 10 to 12 years in the wild, but females may not produce young until age three or four—and thereafter have an average of only two kits every other year. Now add the growing challenge of climate change, which appears to be especially acute in polar and mountainous regions. According to mountain ecologist Dan Fagre of the U.S Geological Survey, the average temperature in rugged northwest Montana has risen 3 degrees F in just the past few decades. This is two to three times the rate recorded in other parts of the globe. Fagre finds the snowpack in Glacier melting off sooner, soils on the slopes heating up earlier and forests marching up into the alpine tundra zone. Boasting 150 glaciers when set aside in 1910, this park is on track to lose its last one by the year 2020, he points out. The implications for wolverines are anything but promising. Researchers are now looking into the effects of increasing levels of disturbance in wolverine denning habitat, from motorized activities such as snowmobiling and heli-skiing to ski touring. Copeland is helping conduct a study in Idaho's national forests to see how wolverines in areas with heavy winter recreational use are faring compared to wolverines that rarely encounter people. "It would be a mistake to view the wolverines holding on in the contiguous states as a single population," he says. "What's left is a metapopulation of widely scattered groups. Many are quite small and inhabit isolated mountain ranges, making the animals exceptionally vulnerable." To endure, each of these surviving enclaves needs to be more carefully safeguarded. Most of all, each needs to be connected to others, for none is large enough to stay viable over time by itself. With that in mind, researchers are mapping out landscape corridors that would give gulos the best chance to keep in contact with one another throughout the mountain West. That the experts' models extend to Colorado, Utah and California is promising, especially since, within the past two years, one wolverine showed up in California and another in Colorado after an absence of nearly a century. Both were young males dispersing from points far to the north. Let's hope the next young explorer to arrive brings a date. "Originally," Inman says, "we set aside national parks thinking those areas would safeguard nature by themselves. Then the challenge of conserving big, mobile species—especially carnivores like bears and wolves—forced managers to consider lands around the parks such as national forests as part of the same ecosystem. Wolverines make it clear that if we want to keep wildlife metapopulations going over time, we need to be working on a still larger scale." A petition by Defenders and other conservation groups to list wolverines as endangered was recently accepted for consideration by the U.S. Fish and Wildlife Service. "The agency has acknowledged that the wolverine faces possible extinction simply due to the extremely low number of breeding adults," notes David Gaillard, Defenders' representative for the northern Rockies region. "When you add climate change, plus ongoing development and disturbance in the high country, this animal needs protection—now." As the magazine went to press, a decision on the listing petition was still pending. Far roaming, incredibly hardy and indomitably wild, the wolverine embodies a will to live as bright and fierce as any force on the planet. The least we could do is grant this creature the freedom to keep traveling the high country on those big snowshoe paws, safe and undisturbed, while we search for ways to turn down the global thermostat for all our sakes. Montana-based wildlife biologist Douglas H. Chadwick is a longtime Defenders contributor. This article is adapted from his book, The Wolverine Way, to be published this spring by Patagonia books.